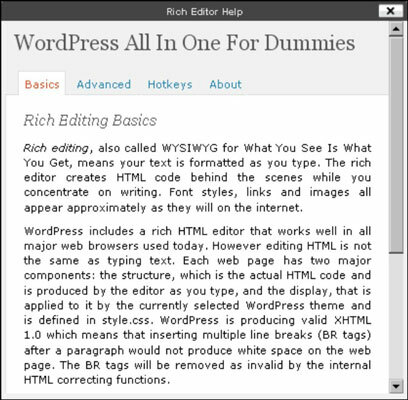 When you write your blog post, WordPress provides a Visual Editing mode, as indicated by the Visual tab that appears above the text. If you want to embed your own HTML code and skip the Visual Text Editor, click the HTML tab that appears to the right of the Visual tab. If you’re planning to type HTML code in your post — for a table or video files, for example — you have to click the HTML tab before you can insert that code. If you don’t, the Visual Text Editor formats your code, and it most likely looks nothing like you intended it to. 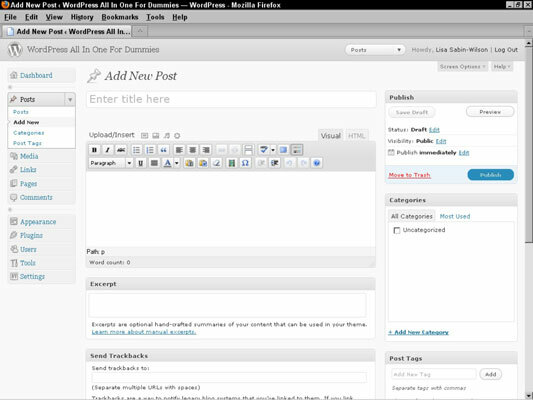 Visual Editing mode provides WYSIWYG (What You See Is What You Get) options for formatting. Rather than have to embed HTML code in your post, you can simply type your post, highlight the text you want to format, and click the buttons that appear above the text box in which you type your post. 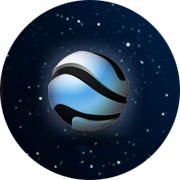 You can turn off the Visual Text Editor by clicking Your Profile in the Users drop-down list. Deselect the Use the Visual Editor When Writing check box to turn off this editor if you want to insert the HTML code in your posts yourself. If you want to embed your own HTML code and skip the Visual Text Editor, click the HTML tab that appears to the right of the Visual tab. If you’re planning to type HTML code in your post — for a table or video files, for example — you have to click the HTML tab before you can insert that code. If you don’t, the Visual Text Editor formats your code, and it most likely looks nothing like you intended it to. Thanks to dummies.com for their excellent material on this topic.